Telesat president and CEO Daniel Goldberg. Credit: SpaceNews/Kate Patterson. 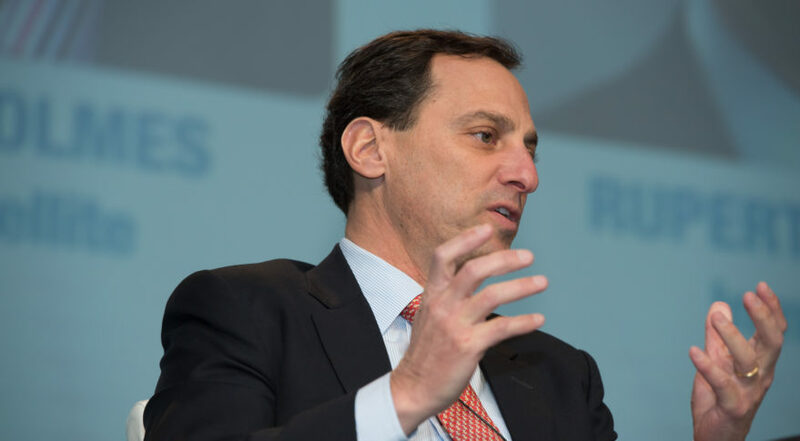 WASHINGTON — Telesat CEO Dan Goldberg said his company has refrained from running headlong with other fleet operators in adding new telecom satellites over areas now burdened by an oversupply of capacity. That glut of satellite capacity in Asia, Africa and Latin America puts pressure on fleet operators to consolidate, but the industry shouldn’t look to Telesat to initiate any mergers or acquisitions, he said. Goldberg said Telesat is focusing instead on deploying a constellation of small satellites in low Earth orbit (LEO), which would be differentiated from other systems in order to capture “surging” demand for broadband around the world. Telesat reported 927 million Canadian dollars ($718.8 million) in 2017 revenue, down CA$3 million from last year. The operator’s net income increased substantially, however, from CA$293 to CA$505 million thanks to a trifecta of foreign exchange gains on converting Telesat’s U.S. dollar-denominated debt into Canadian dollars, “a larger gain on the fair value of financial instruments in 2017” and a 2016 refinancing loss. Telesat’s Adjusted EBITDA, or earnings before interest, taxes, depreciation and amortization, was CA$757 million, a 1 percent decrease when not counting for changes in foreign exchange rates. Goldberg said Telesat’s forthcoming LEO constellation of 117 Ka-band high-throughput satellites, expected to enter service in 2021, is the company’s answer to investors that have been unimpressed by the lack of growth among the world’s largest fleet operators. Telesat has one prototype LEO satellite in orbit, and has maritime connectivity customer OmniAccess as a partner to test the satellite. Goldberg said other customers will be joining the test, as will companies building user terminals for the system. Telesat, which is based in Ottawa, praised the Canadian government’s decision to spend CA$100 million in funding over five years to support LEO satellites and rural internet access. Last month Telesat LEO’s vice president, Erwin Hudson, said Telesat is months away from selecting a manufacturer for the constellation. The demo satellite in orbit is from Surrey Satellite Technology Limited, a U.K. subsidiary of European aerospace giant Airbus. Space Systems Loral (SSL) of Palo Alto, California, and the University of Toronto’s Space Flight Laboratory built an earlier demo satellite, but the spacecraft never reached orbit because its Soyuz launcher failed. Goldberg said Telesat’s future capital expenditures largely depend on decisions around its LEO constellation. Telesat Chief Financial Officer Michel Cayouette said the company counted CA$479 million in cash and short term investments at the end of December, and has an approximately CA$200 million line of credit with lenders. Goldberg gave no indication whether Telesat will join Intelsat, SES, Eutelsat and Intel in petitioning the U.S. Federal Communications Commission to allow 5G, or fifth-generation, mobile networks to use a 100 MHz portion of satellite C-band spectrum in exchange for mobile networks overing satellite operator costs associated with the change. Goldberg said Canadian telecom regulators “are also eyeing portions of the C-band” for 5G, and that regulators worldwide are hunting for more spectrum to support such networks. Goldberg said Telesat is “participating in and closely following all of those proceedings” to impress upon regulators the importance of the satellite industry’s C-band services and infrastructure. “If changes are going to be made, it needs to get done in a way that is efficient from a broader market perspective, and makes sure that folks that have made investments in this infrastructure — significant investments — that they are able ultimately to recognize a return on those investments,” he said. In the U.S., those changes are more “when” than “if,” given FCC Chairman Ajit Pai’s remarks at Mobile World Congress in Barcelona last week. “In the coming months, I intend to propose the next steps needed to make the 3.7 to 4.2 GHz band available for commercial terrestrial use,” he said. Telesat has only a single-digit percentage of the C-band covering the U.S., but does cover the entire country using three geostationary satellites. Telesat said its fleet utilization rate for satellites covering North America stayed the same at 95 percent for the last three months of 2017. The company’s international fleet utilization grew by four percent in over those three months to 71 percent because of two short-term contracts, Goldberg said. He did not name the customers, but said the capacity is for enterprise connectivity, a classification used for a wide range of customers from banks and financial institutions to gas stations, retail stores and mining sites. SpaceX is launching two SSL-built geostationary satellites for Telesat this year on Falcon 9 rockets. One, Telstar 18 Vantage, is a replacement satellite for Telstar 18 over the Asia Pacific at 138-degrees east. Regional fleet operator APT Satellite of Hong Kong is paying for 57.5 percent of the satellite in exchange for 57.5 percent of its capacity. The second satellite, Telstar 19 Vantage, is a growth satellite covering the Americas that Telesat plans to co-locate with its Telstar 14R/Estrela do Sul 2 satellite at 63-degrees west. Goldberg said the business case for Telstar 19 Vantage “in some ways was just a no-brainer given what we were seeing in the market,” — a decision aided by Hughes Network Systems’ agreement to use all of the satellite’s Ka-band capacity over South America before Telesat committed to buying it. Bell Canada signed a similar deal in September for nearly all of Telstar 19 Vantage’s Ka-band capacity over Canada. Goldberg said Telstar 18 Vantage has new Ku-band high-throughput capacity that will focus on enterprise customers. The business case for the new capacity is less clear compared to Telstar 19 Vantage, but traffic migrated over from Telstar 18 will support the new satellite, he said.